One evening as I cut through the edge of Korean Town and Kabuki-cho after shooting in Golden Gai I stopped to watch a chinese noodle maker. 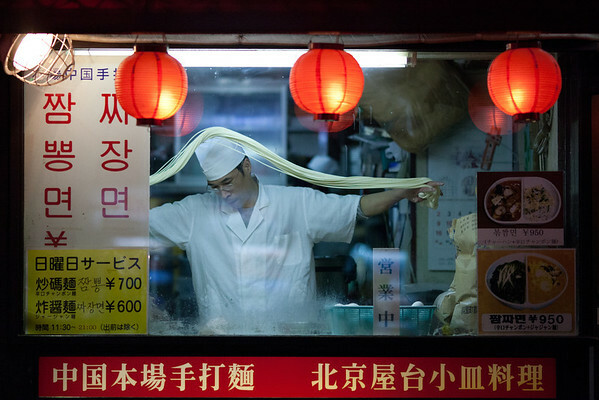 I watched as he pulled, tossed and stretched noodles to the perfect length and thickness. It was fascinating watching him. Korean Town, the Korean-orientated commercial district around Shin-Okubo Station in Shinjuku, is dominated by recent immigrants from South Korea who have retained their ethic and cultural identity. There are currently about 80,000 Koreans living in Tokyo. If you didn’t know you were in Tokyo, you could easily be fooled that you are in South Korea. Well timed and great capture!